(TBILISI)--Tbilisi Mayor Kakha Kaladze has announced that he has dismissed two employees for violating tender conditions and ignoring mandatory expertise for the Varketili metro station, which could be the reason of the ceiling collapse in the newly-renovated facility, leaving 14 people injured. Kaladze stated that an internal audit revealed the violations and five or six more employees could also be fired until the Interior Ministry investigation presented the outcomes of the case. "The internal audit of the City Hall began examination and, unfortunately, violations have been identified. In particular, two employees made biased decisions in favor of their family members,” Kaladze stated. “I have repeatedly stated that we need only professional and honest people who will serve the city and the people living here,” the mayor added. Varketili metro ceiling collapsed on January 30, this year. 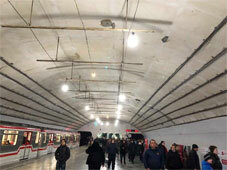 Rehabilitation-renovation works in Varketili metro were completed six months ago by the Kvarelmsheni LTD. The Tbilisi Mayor’s Office allocated 347,852 GEL for the works. The LTD leadership excluded violations and stated that the Tbilisi Mayor’s Office “had no remarks” when they finished works in the metro. The company rehabilitated the Akhmeteli Metro Station as well and the Mayor’s Office has already checked the safety in the station. 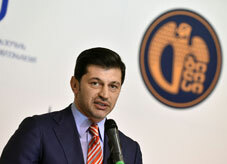 Kaladze had vowed tough punishment for those who committed violations during the rehabilitation works. The opposition accused the Tbilisi Mayor’s office of poor monitoring and checking quality of works and biased decisions in terms of a tender participant companies. Some of the people injured during the collapse are still being treated at home. Their treatment expenses were either covered within the General Healthcare Program or by the Tbilisi City Hall.